For more information about pectin, as well as techniques for many other food preservation methods, buy the book The Home Preserving Bible by Carole Cancler. When making old-fashioned cooked jams and jellies without adding commercial pectin, it’s a good practice to combine one-quarter under-ripe fruit with three-quarters fully ripe fruit. Under-ripe fruit with high pectin levels help to ensure sufficient pectin for a thick gel, while ripe fruit provides the best flavor. Avoid overly ripe fruit. Some combinations to consider are currant and rhubarb, blackberry and raspberry, cranberry and blueberry, or under ripe apples with any other fruit. You can also add an acid such as lemon juice to any fruit or any combination to help pectin gel and make thicker jams. I have successfully made thick, spreadable jam from raspberries, apricots, or nectarines by simply adding sugar and lemon juice, and then cooking the mixture until it gels. A small batch of homemade jam using 4 to 6 pounds of fresh fruit usually takes less than an hour to cook (between 30 and 50 minutes). Bring it to a boil, then boil hard for 8-10 minutes, and then test for consistency. If the consistency you want has not been reached, continue to boil and stir every 3 to 5 minutes to prevent sticking and burning. Freezer test: Chill a plate in the freezer for at least 15 minutes. Spoon a small amount of boiling jam or jelly onto the plate and put it back in the freezer for 1 to 2 minutes. Check consistency of cold jam or jelly for desired thickness. Spoon or sheet test: Dip a cold metal spoon into boiling jam or jelly mixture. Hold the spoon horizontally, so mixture runs off side of the bowl. In the early stages of cooking, liquid will easily drip from the spoon. As mixture continues to boil, liquid will thicken and fall off a couple drips at a time. When mixture falls off the spoon in a sheet instead of drips, it has reached the jellying stage. Temperature test: A candy or instant thermometer reads 215°F to 222°F. Temperatures from 215°F to 218 °F create runny jams and jellies; from 218°F to 220°F create spreadable jams, and 220°F to 222°F create firm and stiff gels that hold their shape. You may want to combine a temperature test with the freezer or spoon test to confirm the consistency. While testing, be sure to remove the jam or jelly mixture from the heat so it doesn’t overcook while you test the consistency. The thickness of a jam or jelly is ultimately a matter of personal preference. When preparing jam, you can cook it to your preferred consistency—runny, thin and syrupy, or thick and spreadable. Longer cooking also tends to increase the caramel flavor that you may or may not prefer. If you are using a thermometer, old-fashioned recipes often stipulate a temperature of 222°F, but I find these jams to be very stiff and may take on a burned flavor. Below 218°F, they’re soft and runny, but between 218°F and 220°F, most fruits are thick and spreadable, and may take on an agreeable caramel flavor. I have successfully made very thick, spreadable jam from low pectin fruits simply by adding sugar and lemon juice, and then cooking the mixture until it reaches 218° to 220°F. The modern method for making jam and jelly uses commercially manufactured pectin, sold in powdered or liquid form. Commercial pectin more reliably produces thick jams and jellies without any guesswork. Because they cook quickly, these jams capture the fresh flavor of ripe fruits, without any caramel-like flavors sometimes present in long-cooked, traditional jams. However, commercial pectin requires rather high levels of sugar, unless you use pectin formulated for low sugar or no sugar jams and jellies. If you use commercial pectin, be sure to follow the instructions included in the package you are using; they are not interchangeable from one type of pectin to another. Cooked jams with or without homemade pectin offer more flexibility over commercial pectin jam recipes. Don’t be afraid to experiment. The worst-case scenario is you end up with sauce instead of jam—which is still delicious when drizzled on a stack of pancakes or over a dish of ice cream or yogurt. You may be surprised to learn that it’s easy to make homemade apple or orange fruit pectin for cooked jam recipes. Working with natural pectin to make jams and jellies takes practice but can be fun and rewarding. < Shop for some of our favorite food preservation and cooking tools and equipment on the Amazon marketplace. Then simply order and pay using your safe and secure Amazon account. Enjoy! Tagged berries, grapes, pome fruits, pomegranate, stone fruits, tropical fruits. If you make Rhubarb jam using fesh lemon as pectin….Do you have to freeze it in freezer or not. Making it 3 months in advance putting in jars. But would like to know how to store the jars in frigerator or freezer? Making 200 jars for a wedding ahead of time….but afraid it wouldn’t keep that long unless it’s frozen? Looking for help on this one!!!! Unsure if it will keep if not refrigerated or frozen. Any help would be apppreciated. Hi Julie–First, best wishes for your upcoming wedding and marriage! Second, for jam, 3 months is too long to keep it in the refrigerator–the rule of thumb is 1 month. 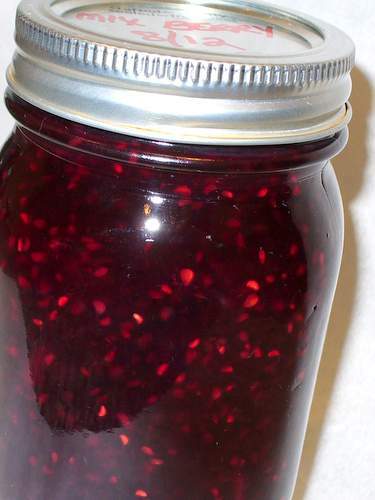 The more sugar a jam contains, the longer you can store it. So, you will need to can or freeze the jam. Let me know what you decide, or don’t hesitate to email me (carole@homepreservingbible.com) if you have more questions.